Brandon Feehery is originally from Homewood, IL but moved to beautiful Knoxville, TN where he races professionally. He has been a professional cyclist for the last 8 years and racing bikes since the age of 10. Brandon thinks the best part of being a professional cyclist is the opportunity to push himself to the limits every day and he loves the speed that one can hit on the bike. Brandon works at the YMCA as a personal trainer, spin class teacher, and coaches athletes as well. He enjoys working at the YMCA because he has the opportunity to help people reach their fitness and health goals. Seeing people reach goals brings a big smile on his face; he says there is nothing better in life than seeing people accomplish something that they didn't think was possible. All my life, I have wanted to do something that is bigger than me and have an impact to help change the world. 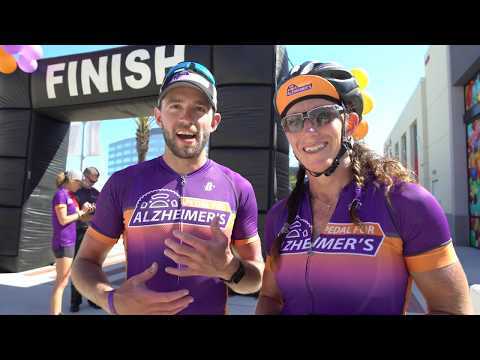 When I found the opportunity to do what I love (cycling) and join a team to help fight Alzheimer's, I jumped on the opportunity. Riding for Alzheimer's has really made a huge impact on my life and in my heart. Every time I get on my bike, I think about this nasty disease and it gives me that extra push to keep fighting to do what I can to help find a cure. The best part about Pedal for Pat 2017 was seeing everyone push past their limits every day for 1,098 miles. Being part of Pedal for Alzheimer's in 2018 was another incredible experience, and I am excited to be the Event Coordinator this year and push past limits and do everything I can to help raise awareness and fight this disease.